We stayed at Sunny Apartments May 2007, the studio was like most Greek studios, basic but OK, the only bad thing I can say was the beds were realy, I mean realy hard and by far the most uncomfortable I have had to sleep on in Greece in 25 years, thats 50 holidays !!!!!!! PS I forgot, the shower head didn't work, so I bought one from the plumbers merchent (about 3 euros) about a mile towards Sidari. 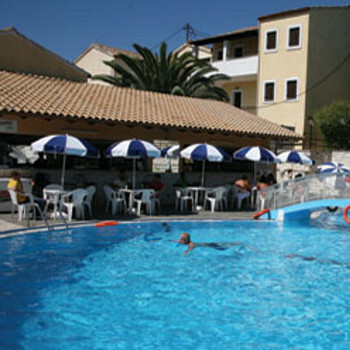 Booked Sunny studios Kassiopi as they looked nice in the brochure. What the brochure doesnt tell you is you may be placed in Smile appartments which are owned by the same person. We were unfortunate enough to be placed in these which were over a supermarket. Very small (like a cupboard) very dark and dingy.